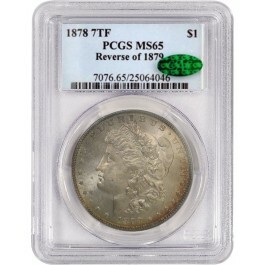 An 1878 7 Tail Feathers Reverse Of 1879 Morgan Silver Dollar graded MS-65 by PCGS and re-certified by CAC. This piece displays a metallic silver color and beautiful orange/red toning around the fields near the rim on the obverse and reverse. An original vibrant luster is also present giving this coin very nice eye appeal. Please view our photos for additional information. The total mintage for this date & variety: 9,759,300.